If you are using windows then DLL errors are the most popular errors you will face. DLL stands for Dynamic-link library and these errors are caused due to corrupted or missing DLL files, You may face these errors while installing a certain programs. So one of the most efficient way to fix these errors are to register the corrupted DLL files again. 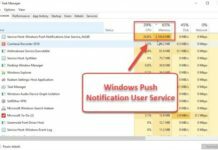 So in this article I’ll be covering how to fix msvcp110.dll is missing from your computer error. > This application failed to start because msvcp110.dll was not found. Re-installing the application may fix this problem. > Cannot start (APPLICATION). A required component is missing: msvcp110.dll. Please install (APPLICATION) again. How this Error Occurs ? Corrupted or missing msvcp110.dll file. This error can be easily solved by fixing the above problems, So first let’s start with recovering the missing msvcp110.dll file. You may have accidentally deleted msvcp110.dll file, So check your recycle bin to make it sure. If you find it there then restore it. If you didn’t found it then you need to download it again, So simply follow the below guide. First of all download Visual C++ Redistributable for Visual Studio 2012 Update 4. After your downloading is competed run it. This will replace the corrupted msvcp110.dll file with a new one. This will definitely fix the error but if you’re still facing the same error then you can try other troubleshooting steps given below. 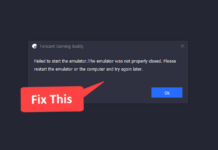 If you get this error while installing certain programs then this indicates registry issues. So I recommended to use CCleaner (which is a freeware) to fix registry errors. It’s simple to use just run CCleaners and start scanning for registry errors. If none of the above methods worked then it is possible that you PC might be infected by viruses or malwares. I recommend using Avast free antivirus to check your PC for viruses and malwares. Make sure to scan the directory where windows is installed. In most cases it’s C Drive. The best thing about windows is that it allows us to restore our PC in its previous state. Which means if your PC was working fine at 1/1/2015 and next day it’s screwed up then you can restore it to its previous state. Right click Computer (My computer) and select properties. On the left hand side select Advanced system settings. 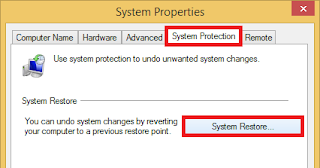 Switch to System Protection tab and select System Restore. Now you can see this window, Click on scan for affected programs. 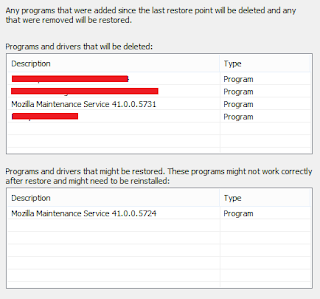 This will show you the list of programs that will get deleted and recovered after performing system restore. 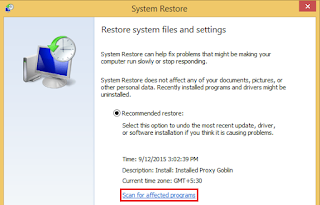 If any of your important program is in the list then backup it before performing system restore. Click Next and it will start the process of system restore. Hope you are able to solve msvcp110.dll is missing from your computer error. If the problem still persist then do comment below.